During your visit to the Beaumont Inn bed and breakfast, see some of the area’s beautiful horse farms. There are about 450 horse farms in our region. Since they are working farms, you need to visit with a guide/tour company or call the farm ahead to make an appointment. The Kentucky Horse Park also offers a good close-up experience with horses. 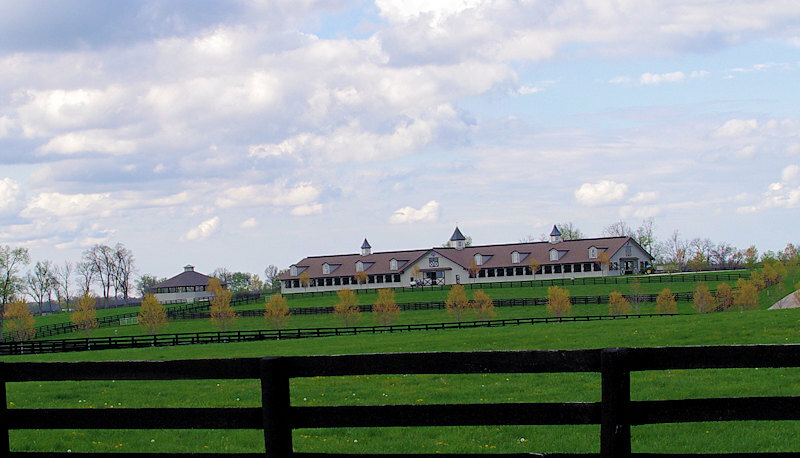 Charismatic (1999): Lane’s End Farm, near Versailles at 1500 Midway Road in Woodford County, (859) 873-7300. Visitors should call for an appointment. Tours are limited during breeding season. Silver Charm (1997) and Seattle Slew (1977): Three Chimneys Farm, 1981 Old Frankfort Pike, Midway, (859) 873-7053. Regular tours are available by appointment. Call several months in advance for Keeneland sales and Derby week. Go for Gin (1994) and Unbridled (1990): Claiborne Farm, 703 Winchester Road, Paris, (859) 233-4252. Visitors may call ahead for a free*guided tour led by stallion grooms. Visiting hours are limited, especially during breeding season. Thunder Gluch (1995) and Fusaichi Pegasus (2000): Ashford Stud, 3 Miles past Versailles on U.S. 60 toward Frankfort. (859) 873-7088. Tours by appointment. *** Or pick up a brochure at the front desk of Horse Farm Tours, a bus tour which starts in Lexington of area horse farms. Highly recommended. Horse Farm Self Guided Tours: Horse Country is a non-profit consortium of 36 Central Kentucky farms and other equine organizations who have come together to offer the visitor a valued experience. The farms, veterinary clinics and feed mills have great stories to tell about how horses are conceived, born, nourished, cared for and trained to become glamorous competitive athletes. Visit VisitHorseCountry.com for more information and/or book a tour. After a day enjoying the horse farms, return to fine food and accommodations at the Beaumont Inn, a full-service bed and breakfast.